The North Marion boys soccer team leapt into second place in the Tri-Valley standings after scoring back-to-back shutout victories last week at home. The Huskies (4-3-3, 3-0-3 Tri-Valley Conference) entered the week in sore need of wins after going 1-2-3 since a non-conference win at Crescent Valley on Sept. 4. The team responded with a pair of decisive defensive performances, beginning with a 5-0 decision against Corbett on Oct. 2. The Cardinals (4-6, 1-5 TVC) were the final league opponent left to play through the first half of conference play, and the Huskies were quick to gain the advantage, scoring on a 22-yard strike from senior Edgar Lopez 12 minutes into the match. Twelve minutes later, junior Barsilay Carrillo made it 2-0 on a header from point blank range, and junior Isaac Santiago added a third at the 26-minute mark to give the Huskies a three-goal lead heading into the half. North Marion tacked on a pair of scores in the second half to round out the offensive performance. The Huskies wrapped up the week Thursday with a 2-0 win over Molalla (3-4-3, 3-1-2), leaping over the Indians in the league standings. It was a marked improvement over the 2-2 draw the two teams played to in the league opener in September. As the Huskies continue play in the second half of their league schedule, the team's first-half woes are starting to become slightly more valuable. Although North Marion only won two of its first five league games, the Huskies are the lone Tri-Valley team that has yet to record a loss on the season. As a result, the team is in control of its own playoff destiny with four games left in the regular season. 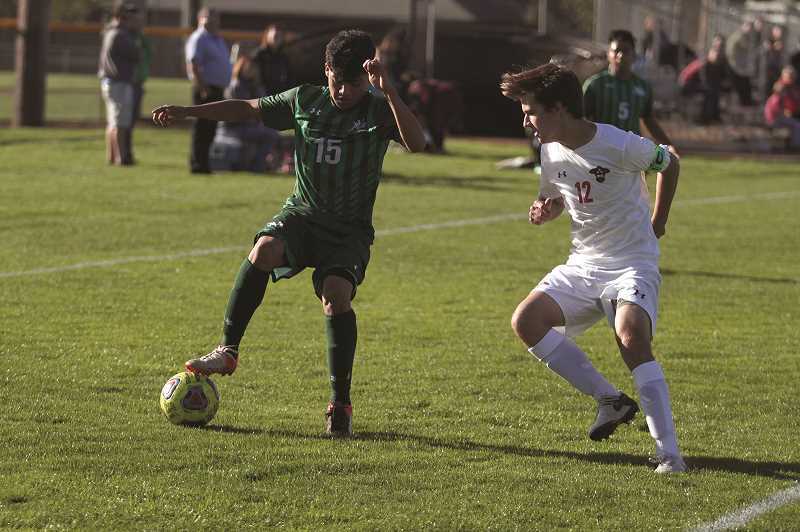 The biggest test is scheduled for Wednesday, when the Huskies host the league-leading Madras White Buffaloes (7-2-1, 4-1-1 TVC) in the lone game of the week. The two teams previously played to a 2-2 draw. Kickoff for the game is set for 4 p.m. at North Marion High School.